Who are they kidding? Fans?! Well, they are eternal optimists. So they started a Facebook Page. 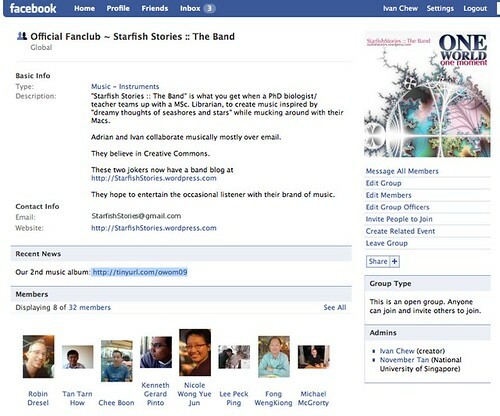 Their first fan club was started, totally unsolicited, in 2007 by a fan “in the form of a monkey” – her words, not ours! 🙂 But that club was for our first album. The Facebook fan club is probably defunct by now, after Facebook introduced Pages. They don’t really post that frequently at the Facebook page. And they hate spam messages just like you. So don’t worry, they won’t spam you with too much self-indulgent posts.